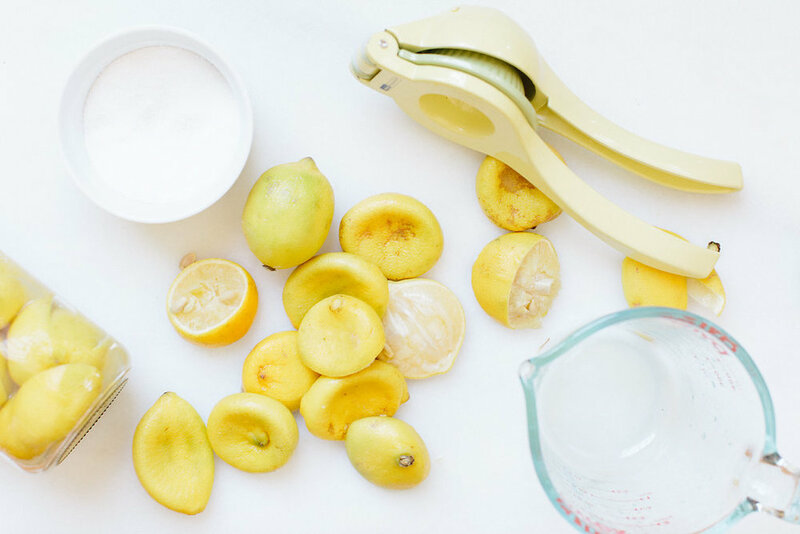 A squeeze of lemon will brighten any dish. But chewing on the peel? Sounds crazy, I know. I recently fell in love with preserved lemons because they pack all the lemony goodness, without the pucker-inducing tart. I like to toss preserved lemon peel into a light pasta, sprinkle on white fish, combine with roasted Brussels sprouts, or even cut into thicker strips and serve on a cheese platter alongside olives (a favorite lazy dinner…). Preserved lemons are easy to make, but take a little time, so don’t try this right before you need them. Keep a jar on hand so you can add a flavorful, healthy kick to any meal. Hit play below for a quick DIY tutorial! Trim the ends of five lemons, then cut each lengthwise into quarters, being careful not to slice through to the bottom (the quarters should still be attached to the base). Juice the remaining three lemons. 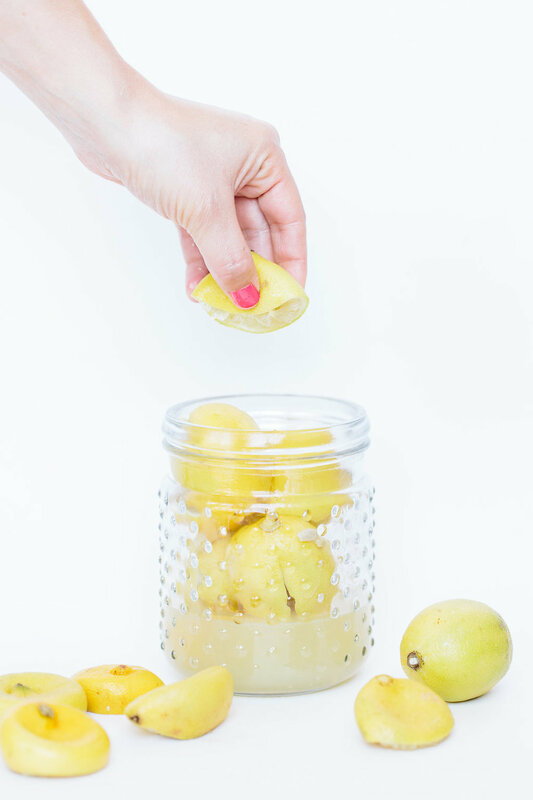 Rub a generous amount of salt on the inside of the five quartered lemons, then stuff into a jar. Press down with a muddler to push them in further. This will also help extract more juice. Seal jar and store in cool, dry place for 3-4 weeks, shaking occasionally to distribute the salt (once the peel is translucent, they are ready to use). To use lemon, remove a quarter and rinse away salt. Remove fruit and pith (the white part) and discard (it will be mushy and overly salty). Cut peel into thin strips, then cut strips into a small dice. WHY #1? : It’s really important to buy high quality, organic lemons because you’ll be eating the peel. WHY #2? : If the lemons are not completely covered with liquid, a mold can form on top. You can remove the mold and add more lemon juice, but it’s best to not let it form. Note: As long as the lemons are covered in juice, they’ll last on your counter for over a year. However, you may store in refrigerator if you prefer. Note: This same method works for limes and oranges, too.